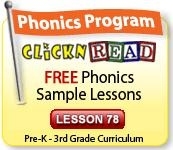 ClickN' READ Phonics contains 100 precisely sequenced, research based lessons designed by nationally recognized research professor Dr. J. Ron Nelson resulting in a beginning reading program that is beyond compare and has redefined computer based instruction. 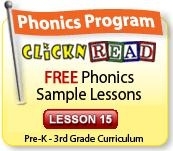 All other phonics products and programs are simply toys when compared to ClickN' READ Phonics. Used by Schools and Homes in Over 100 Countries for 6 Years!